Again I was searching for store-bought sauce and again my search leads me to - no where! I dont mind making the sauce, but it would be nice to at least have a taste of the 'original' sauce. A commentor suggested to try making harissa sauce with roasted capsicum instead of chilli. Brilliant idea. I have few capsicums in my fridge, took out a couple of them; red and yellow (I find these colours are the sweetest of all capsicums). I set out to chargrill capsicum, early in the morning, as soon as I stepped into the house after sending E off to the train station. She hates capsicum, cant stand the smell, let alone eating!! She finds capsium repulsive. Mom had to tell white lies with a straight face - "No"
Place capsicums under the griller/broiler or over stove. Grill under skins starts to blister and blackened. Immediately wrap in plastic and leave it aside to cool. Pan roast caraway, cumin seeds and garlic separately. Finely ground cumin and caraway. Peel off the capsicum charred skins. Place capsicum, chilli, garlic, sugar, EVOO and spices in a food processor and process to a smooth paste. Clean and pat dry the chicken. Using a sharp pair of scissors, cut away the back bone and gently push it down to flatten (butterflied). Loosen the skin and rub some salt in the cavity. Rub harissa sauce all over and in the chicken cavity as well as under the skins. Refrigerate for 3 hours or preferably overnight. Take out the marinated chicken an hour prior to baking to bring it to room temperature. Pre heat the oven to 200C (and if you are using Circotherm oven, set it to Circo-roasting; temperature 170C). Roast the chicken for 45-50 minutes (until the juice runs clear when skewer is inserted in the thigh and breast). Scrumptious! I love those flavors. 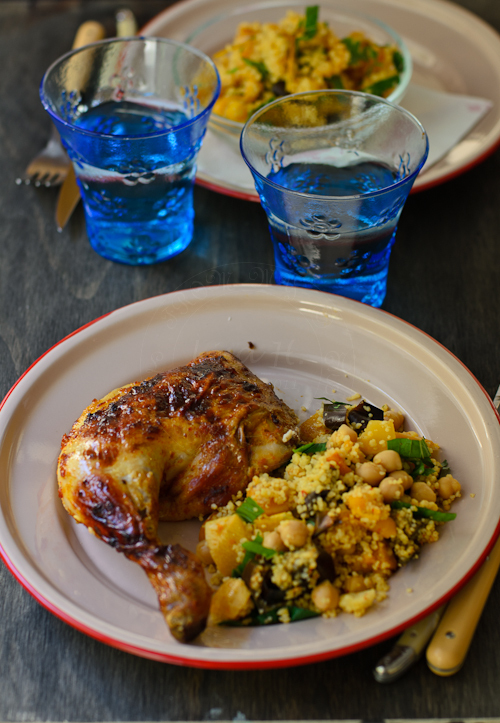 Succulent looking roast chicken you have made and moreover you made your own harissa sauce. Bet it must be very flavourful and tasty chicken. All the colors and flavors! That's how I want my chicken dish to look like! I love Harissa sauce!! The roasted chicken looks scrumptious, Lisa. This looks delicious! We love Harissa, too. I found a good one at our local Whole Foods - Mina brand. this shows that you are a good cook but not a good liar...LOL! Triple yum! The chicken has such a gorgeous colour, too! my girl likes capsicum but not for two boys..for me the sauce sound really tempting! The chicken looks lovely! My family love roast chicken and I have a jar of harissa sauce in the cupboard so I will be trying this soon.